Lt. 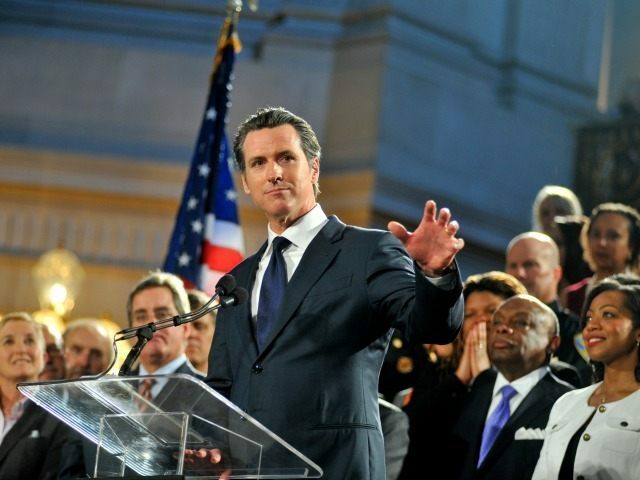 Governor Gavin Newsom’s (D) is betting his political future on gun control, especially his future plans to succeed Jerry Brown (D) as Governor of California. According to KQED News, Newsom’s three-tiered platform is gun control, legalization of marijuana, and an increase in the minimum wage in California. He admits that these are not the three things that are most important to Californians. Rather, they are the three things through which he can most clearly demonstrate his liberal Democrat credentials. Newsom’s gun control push is a ballot initiative to ban possession of a “high capacity” magazines in the state of California and require background checks for ammunition purchases. The information gathered from ammunition background checks would be added to California’s database of gun owners and used to pinpoint prohibited gun owners whose weapons the state can confiscate. Breitbart News previously reported that Newsom believes a citizenry armed for self-defense can actually make things worse in a mass shooting situation. On November 20, he told HBO’s Bill Maher that stories of good guys with guns stopping bad guys with guns are part of “mythology.” However, he did not explain the fact that he spent millions of taxpayers dollars on armed security–good guys with guns–since being elected Mayor of San Francisco in 2003. Newsom is approaching the legalization of marijuana and an increase in the minimum wage as a way to “stop the war on the poor.” He claims “the war on marijuana…is disproportionately a war on people of color and on poor people.” And he says the same of California’s current minimum wage.